Today we bring you another installment of how to spend your classic vintage car dollars. This isn’t meant to reflect “top picks” by any means. But rather, several picks that we recommend entertaining if you’re shopping. At the end of this segment are a few additional options beyond these listed here that might seem a little familiar. 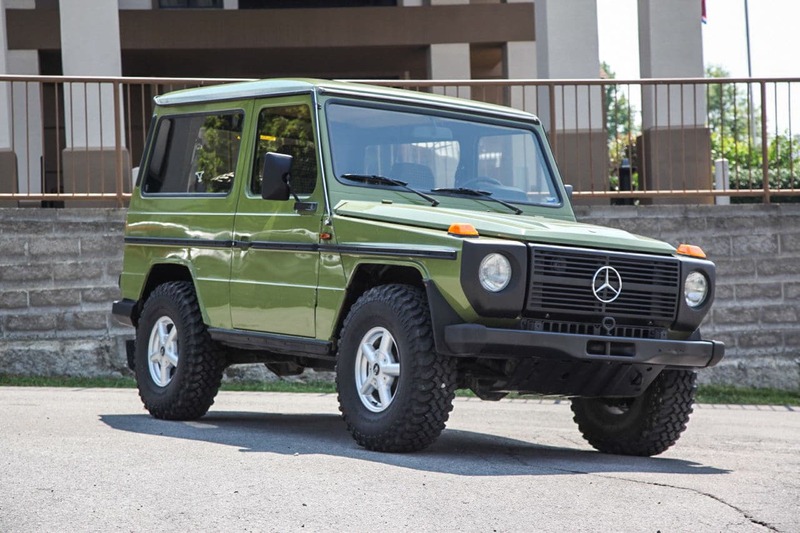 First up, a 1982 Mercedes 230 Gelandewagen…G-wagon for short. You’re probably used to seeing these on TMZ or People magazine…low-res grainy pictures shot through tree limbs of celebrities putting their groceries in the back or just coming from the gym. 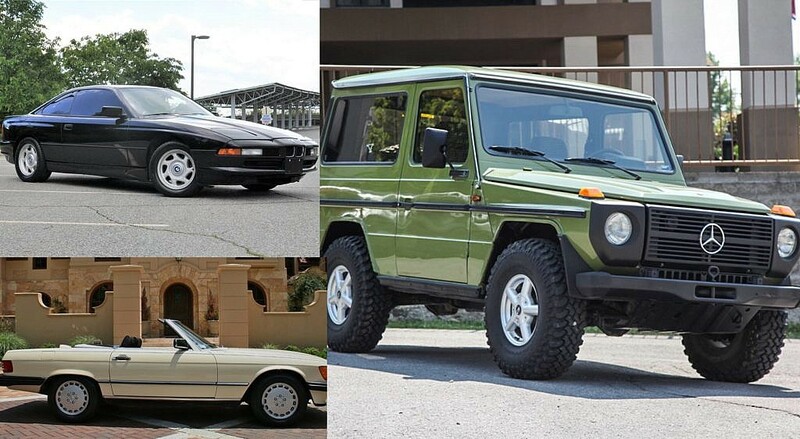 Well believe it or not, the MB G-wagens are some of the best off-road capable vehicles ever made…ever. Originally developed as a military vehicle, it was first offered to the public in 1979, but only until 2002 were they sold in the US. Luckily, as with the Defenders, they are starting to age in and can now be imported legally into the U.S. Don’t buy one thinking you’re getting typical MB luxury though, you’ll be disappointed. These early ones stay true to their military roots This one was sold through Niche Motors of Nashville, TN. Another Mercedes-Benz sneaking into the picks here. The 560SL is internally known as the R107 platform, and is one of the longest MB productions series (’71 – ’89) second only to the aforementioned G-class. The SL series began as the 230 in 1971, and this 560 is one of the last produced variants of the line up (made through ’86-’89). It’s also the most luxurious and houses the largest engine of the series, a 5.6L V8 pumping out 227hp. The 560SL was designed in response to the 500SL that wasn’t available to the U.S. except for the gray market. U.S. bumper arguments are sure to ensue, but it’s what we’re used to here. This is one you’ll simply have to test drive and compare against the XJ-S V12 if you’re in the market for a luxury convertible GT cruiser. We love our V12’s here at Second Daily. What’s not to love with gas prices less than $3/gallon in the U.S. Next to the M-powered BMW’s, the 850 series should highly be considered if you’re looking for something unique from an otherwise ubiquitous automaker. 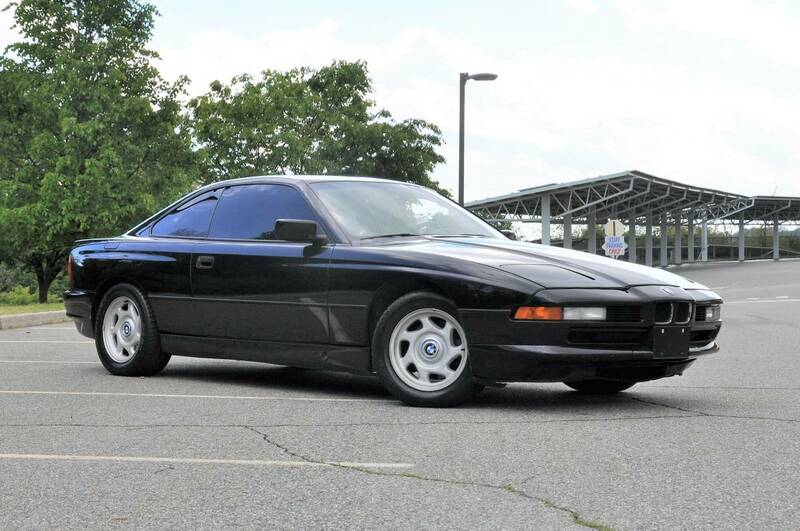 The 8-series Bimmers are 2-door coupe grand tourers produced from 1989 to 1999 and came equipped with a V8 or a V12 (available in the US starting in 1991). They weren’t designed as a 6-series replacement but rather to appeal to a market looking for something more refined, more upscale and luxurious, more GT than the 6-series offered. Variants include the 850i (first model launched, equipped with a V12), the 840Ci (from ’93 – ’99, V8 or V12), the 850Ci (the 850i renamed in 1993), and the 850CSi (top of the line built from the M8 prototype…so think what an M8 would be had they ever produced it). The market is ripe for these GT’s and the automaker just announced the 8-series is back for the 2018 market. You may see some listed repeats here from our earlier segment on 5 ways to spend $10k…that’s because of the wide-price ranges we see in the market. As with many of these cars, condition, history and mileage dictate a large percentage of the variance. That means you’re also likely to see some of these in our next segment of how to spend $30k when classic/vintage car shopping. Have something you would like to feature…CONTACT US…no selling fees…just enthusiasts helping enthusiasts. This entry was posted in German Classics, News/Events and tagged BMW, Defender, g-wagen, g-wagon, Jaguar, mercedes-benz, porsche.